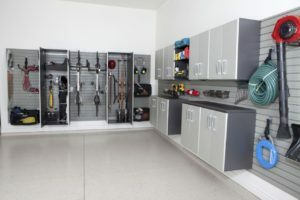 Garages are the unsung heroes of our homes, quietly holding our cars, workbenches, and camping equipment, but they don’t have to look forgotten. In fact, a garage can look quite nice when properly painted. Painting a garage requires a few more steps than painting a regular wall in your home, so we’ve compiled our tips for the best way to make your garage wall paint look amazing. Before you begin the painting process, you will need to clean off your garage walls. Because they are often left unfinished, garage walls, and ceilings, tend to be much dirtier than walls in your home. They accumulate dust and dirt, and often have water damage or oil stains. Whether your garage walls are painted or not, you will need to clean them using a broom or shop vac. Once you’ve removed the majority of the dust, wash the walls with a mild mixture of water and dawn dish soap. The water doesn’t need to be too soapy, you’re mainly focused on making sure the surface is clean of debris and dirt. Don’t use any harsh chemicals or a pressure sprayer to wash walls because it will damage them. If your walls aren’t that dirty, you could skip washing them all together. Make sure you walls have completely dried before you move on to the next step. After cleaning your walls you will need to determine how you are going to prime them. If the surface if unpainted drywall then you will need to prime them before painting. If the walls are already painted you will need to determine whether they were painted with a latex paint or an oil-base paint. The easiest way to determine this is to wash a section of the wall with a mild detergent. Dip a q-tip in alcohol and rub it back and forth. If the paint comes off you’re working with latex, if it doesn’t it’s oil based. Unfinished drywall requires a good surface primer to look its best when painted. You will want to use a drywall primer with PVA (polyvinyl acetate). Because drywall is porous the PVA will help seal the surface and lend durability to the paint you layer on top. If you simply apply garage wall paint to the walls without priming them, most of the garage wall paint will soak into the wall and you will end up with an uneven, bumpy finish. Make your hard work worth it by starting with a primer. If you find the walls already have oil or latex paint you don’t usually need to prime unless you have stains coming through the garage wall paint. If that’s the case a can of oil-based primer over the stain area such as Kilz, Preprite Problock, or Covertstain. Simply spray them on and let them dry. If you have large stains, roll the primer over the whole wall. How you apply the garage wall paint will largely depend on the surface beneath the paint. 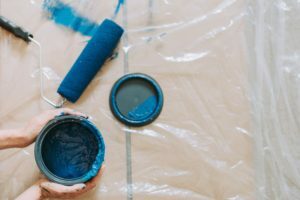 You will need to take into account what kind of paint you have, how to protect your flooring, and plan how long the painting process will take. 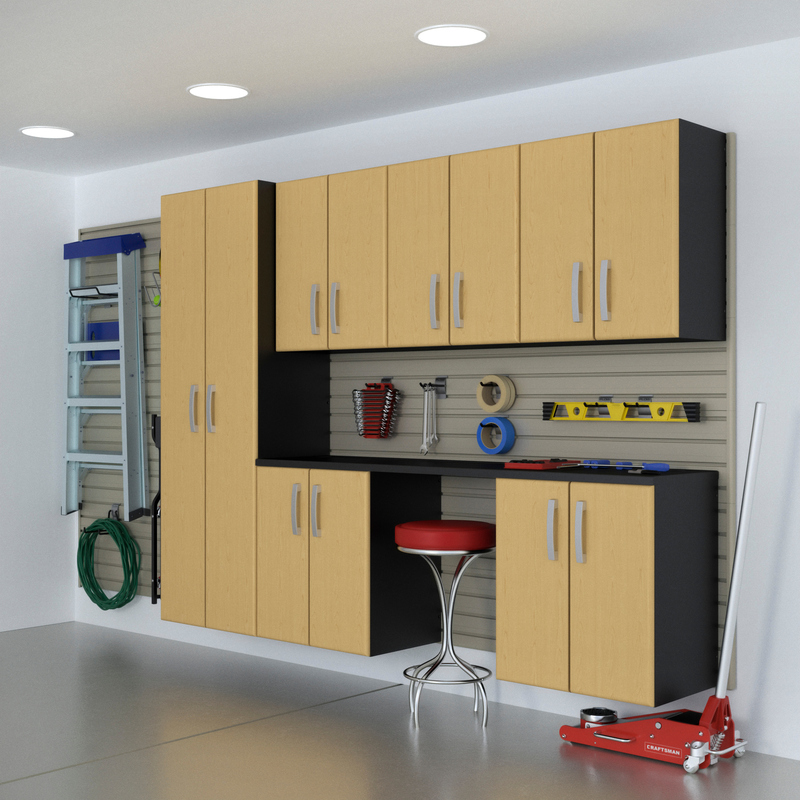 Here are a few simple points to know when applying the best paint for garage walls. 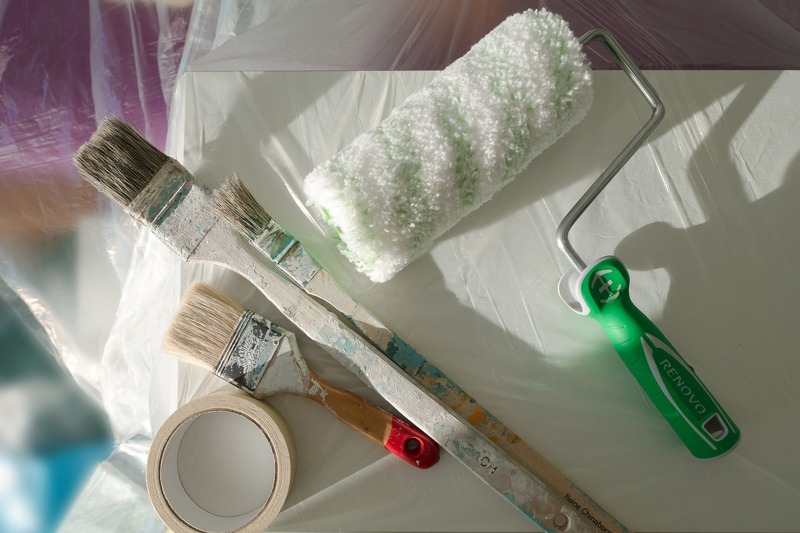 Check Your Paint—Do you have oil of latex paint on the walls? If it is oil-based you must sand the walls and prime them with a bonding primer before painting over them with latex paint. If you don’t want to do that, you can simply paint over it with another oil-based paint. Protect Floor and Garage Hardware—Move everything away from the walls before you begin. If you are painting the ceiling as well, you may want to move everything out. Cover the floor and anything else you don’t want to get paint on. Painting Timeline—You don’t have to do all your painting in one day you just need to make sure the paint is dry before adding another coat. What is the Best Paint for Garage Walls and Ceilings? The best of paint for garage walls and ceilings is interior latex paint. Latex paint is quick drying, has a minimal odor, and because it is water-based, it can be thinned with water instead of paint thinner. Oil based paints are also fine for indoor use, but keep in mind that they take longer to dry, and has a very strong odor. You also need paint thinner to thin oil-based paints. Exterior paint is best left outside because it often has anti-mildew additives and other toxins that can be harmful if used indoors. Even with good ventilation, exterior paint just wasn’t meant to be used in a closed-in space. You don’t want to risk your health when latex paint is just as effective for the job. Latex paint dries faster, is water based, has minimal odor, and can be thinned with water instead of paint thinner. Oil takes longer to dry, has a strong odor, and you must use paint thinner to thin. Garage floors are usually sealed with an epoxy type coating. If you do use paint it must be designed specifically to be used over cement. The same paint for the walls can also be used on the garage ceiling. Whichever garage wall paint you go with, make sure you always have proper ventilation, and allow it to dry between coats. What is the Best Color to Paint a Garage Interior? Now that you know the best type of paint for garage walls, you’re probably trying to determine the best color for your garage space. Many people like white because it looks bright and clean—until something touches it. Bright white is not recommended because it gets very dirty, very quickly, and dark colors may make your garage look dim and cramped. Also take into consideration colors you may already have in your garage, like the garage door or door that leads into your house. You can work off of these colors, or add a pop of color to either one to make a statement. For ceilings, most people prefer to keep them white, or to paint them the same color as the rest of the garage. If the garage floor is a particular color you will want to make sure the walls don’t clash with the floor. 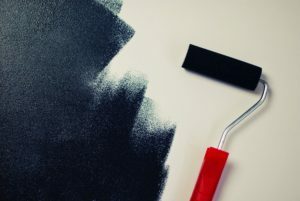 The most highly recommended brands for paint are the Sherwin Williams Pro Classic Acrylic Satin or Semi-gloss and the Sherwin Williams Promar 200 Zero VOC Eggshell (latex). That being said, you don’t need to choose the most expensive paints and primers for your garage. Just make sure the drywall primers have PVA and the paint is good-quality and latex-based. When you head over to purchase your garage wall paint you will also need to know how much to buy. To determine the amount of paint required, you will need to know the square footage you are painting and purchase accordingly. When you’re finished with your garage wall paint job, wash your paintbrush and roller under running water until the water runs clear. Put any extra paint back in the can, and gently tap it closed with a rubber mallet (a paper towel and a hammer will do the job as well). Clean off the paint tray, and store any additional paint at room temperature, away from direct sunlight. How Do I Paint My Garage Walls? Ventilate—Open windows and doors for ventilation. Clean—Dust and wash the garage walls and allow them to dry. Protect—Lay down drop cloths on the floor around the edges of the wall (if you are doing the ceiling and are worried about drips you may want to lay them over the entire floor). Tape—Use painters tape to edge windows and ceiling if you are not painting them. Also cover light switches and outlets. Prime—Begin priming by edging with a paint brush and painting at least 6 inches from the corners, edges and any trim. Use even strokes and not too much paint. Use a roller for the rest of the wall. Paint—Once the primer is dry, apply the paint in the same method as you did the primer. Make sure to use long horizontal strokes, starting at the top of the wall and working down. This helps with drips. Use thin coats of paint. Dry—Let each coat of paint dry before applying the next. Two coats of paint is usually sufficient. Remove—One the paint is fully dry, remove the painters tape by gently pulling at an angle. Wipe—get a damp rag and wipe up any drips while they are still wet. Remove dried drips with an old credit card or spatula. Voila! Your walls will look brand new and beautiful now that you’ve finished your paint job. There are other things you may consider purchasing as well including drywall compound, a putty knife, sanding block, and sandpaper if you need to fix any blemishes on the wall before painting. Wood—very time-consuming and requires multiple rounds of cleaning and sanding. Brick—usually cleaned with a wire brush and TSP. Concrete—cracks must be filled and surface cleaned before painting. Drywall—chips, dents, and nail holes should be filled with drywall compound and sanded before painting. Consider the material you are going to paint and adjust your approach accordingly. What Kind of Paint Should You Use on Drywall? There are a lot of frequently asked questions relating to what the best type of paint for garage walls and ceilings is, so we’ve compiled a short FAQ section to cover it. Q: Can you paint directly on drywall? A: Yes. However, it is not recommended because it will soak it, won’t look as good, and won’t last as long. Q: Is an all-in-one paint and primer good for new drywall? A: Absolutely! Self-priming paint has a “built in” primer similar to PVA that will bind and protect the wall. However, if you have water-damaged drywall or oil stains you must use a stand alone primer before you paint. Q: How many coats of primer should you use? A: One coat is sufficient. Q: Can you paint drywall without a primer? A: Yes, but the paint must have a build in primer. What Kind of Finish Should I Use on My Garage Walls? The type of finish really depends on what you prefer, however, flat or matte paint is not generally recommended because it is difficult to clean and looks dull in a garage. Eggshell is perfectly fine if you prefer this finish. Satin and high-gloss surfaces are highly recommended because they are very easy to clean, look nice with lighter paint colors, and hide dirt very well. People use garages for many different purposes. 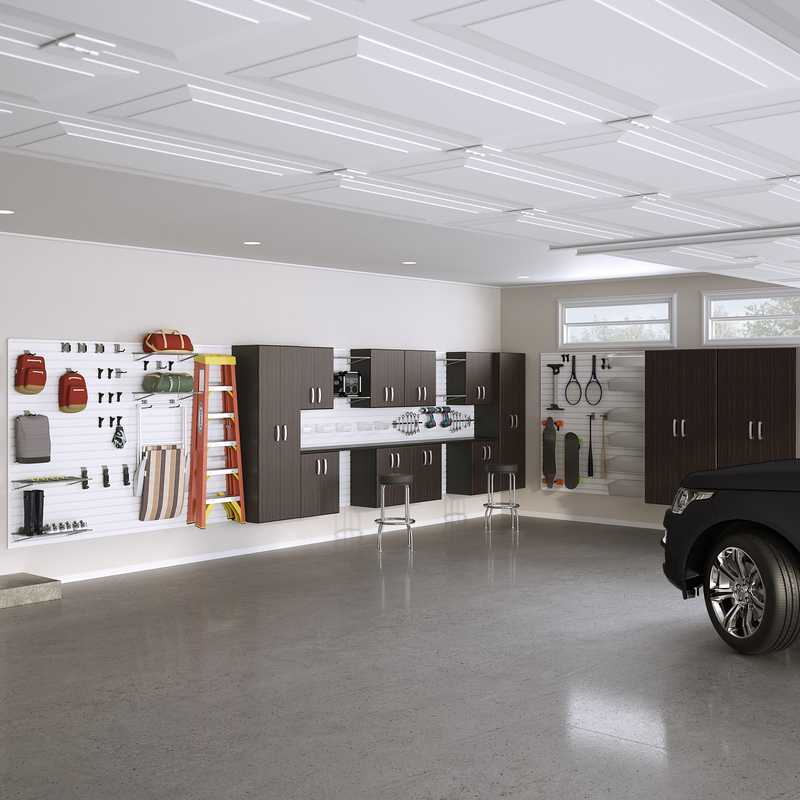 From a gym or a man cave to an entertainment center, your garage can serve many purposes. The purpose of your garage will have an impact on what kind of paint you choose to use. If you work on cars you might not care so much about the walls, but you will need a good sealant or epoxy paint on the garage floor to protect it. If you are thinking of a man cave or entertainment room, you might not mind using a warmer or deeper color to make it feel cozy. If you mainly use it for storage you may want neutral colors to compliment your storage system. Gym lovers may opt to have their own personal workout center in their garage and want vibrant paint colors. The options are endless. 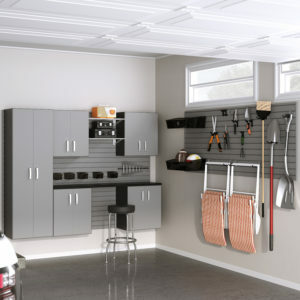 Whatever you use you garage for you can always keep it organized and functional. Find the best paint for your garage walls and ceiling, and create the dream garage that works for you. Interested in learning more? 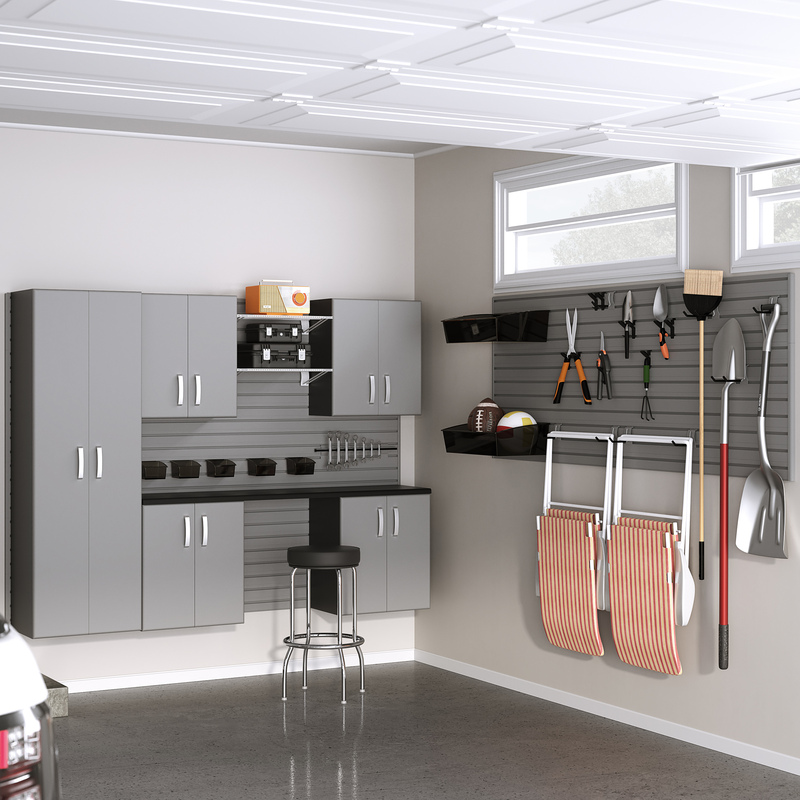 Check out Dave Kindig’s garage remodel for some great ideas.